Foramina means holes, especially in a bone. I found this out trying to Google for more information on this oddity of a game. 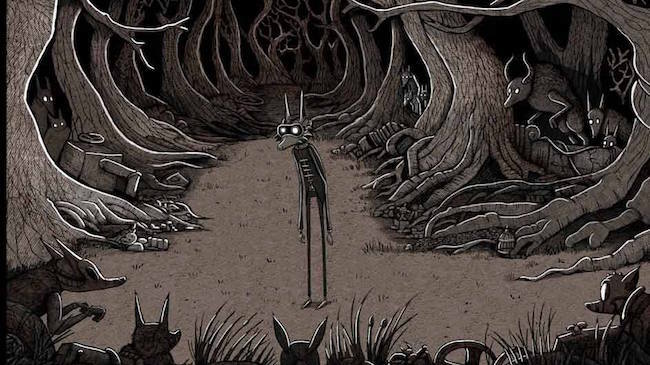 Offering a striking pen and ink look (much like the one used for The Collage Atlas only much, much darker) Foramina is a point and click puzzle adventure game by way of a Gothic fever dream by Tim Burton. 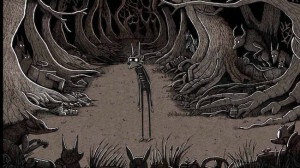 You control a gangly anthropomorphized fox and in the very (very!) short Foramina demo on show at EGX’s Leftfield area. In this demonstration you are in a dark room with a downward light projection. Above you is a candelabra of sorts that a bird perches upon eating something gross. By careful manipulation of the small number of actions available to you (I’m not going to spoil the puzzle) you can make your way onto the candelabra and off down a narrow tunnel (that may, or may not, be the internals of some gruesome creature! 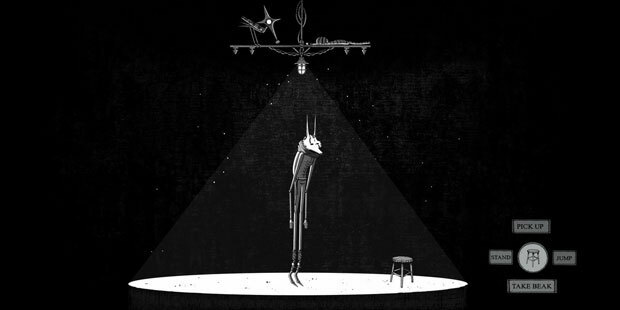 Foramina is a pen-and-ink, single player adventure game set in the surreal, biomechanical world of artist and character designer, Mr. Mead. You play as a fox-masked protagonist who, with mysterious motivation, compels himself through a nightmare world of drone-like natives, reassembled freaks and dream moulders—you will experience clearly drawn acts in a narrative of offbeat, cinematic variety. What’s so engaging about this title is the simple, yet engaging game play mixed with Tom Mead’s striking artwork and scene design. Speaking with Tom at the show he tells me that they only started work on the concept a handful of weeks ago and the deadline for the show was a great driver. He also said this was reasonably simplistic for his usual art and that later scenes in the game would be richer and far more complex. The whole thing feels very much like a tech demo. A place holder for a greater idea (as it should in the Leftfield area), but what it shows is a hell of a lot of promise. If the game can match the benchmarks being set my Mead’s art then we could be in for a real treat when the game sees the light of day.